This weekend marked my first Saturday night off since August. Needless to say I was insanely excited. We got up early and stopped for almond croissants from our favorite bakery on the way to the train and snapped a few photos. Then JD went home and got back in bed and I smiled like a maniac, clutching my bag of pastries the entire way to the office. I kept it casual (and warm!) 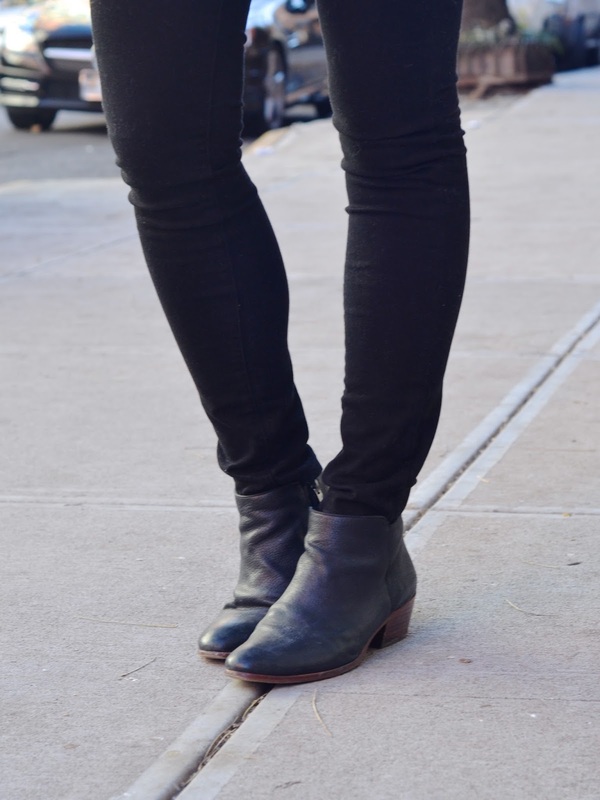 in a simple black and white look made up of wintery basics: a cozy cable knit turtleneck, black skinny pants, and my trusty Sam Edelman ankle boots. While I love the idea of turtlenecks (they're pretty much built in scarves), I do tend to feel like I'm being choked an hour in. I remember wearing this a two years ago on a drive up to Boston and deciding with about twenty minutes to go that I couldn't deal with it. This time I barely noticed it and was far more concerned with all of the little white fuzzies it was leaving all over my pants. You can't win them all. This cable knit sweater is so pretty. Also, your jacket is a classic but also is a little festive for the season but isn't screaming Xmas. You look great. first saturday night off since august?! holy smokes, you deserved those pastries and a few more i would say!! love the look you chose, the coat is so pretty! Seriously love that jacket! So cute! And that sweater looks so cozy!! 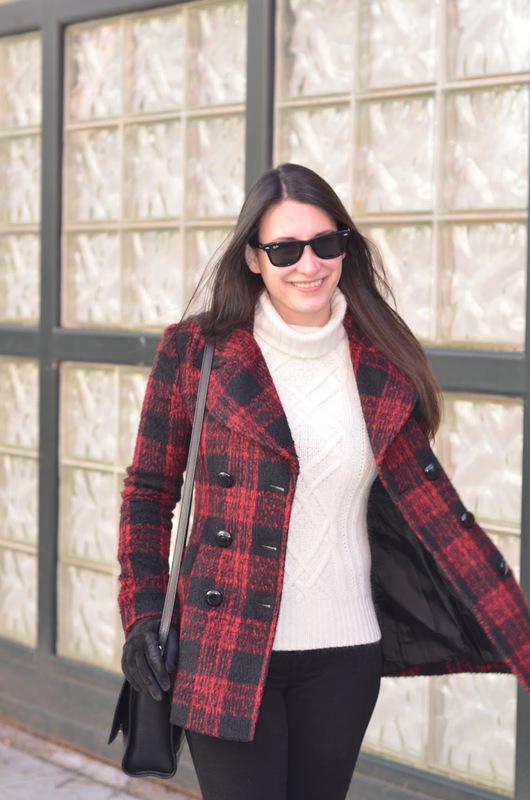 Love this plaid coat! Happy holidays, Lyndsay! Totally on the same page about turtlenecks. I remember crying when I was a kid and my mom tried to stuff my head into them. This one, however, looks perfect on you! This coat is GORGEOUS! Love the way you styled it! Such a cute look! I live in turtlenecks once it gets really cold! Loving this classic cable knit version. And of course I love your red plaid coat...perfect for the holidays! Love this look! That looks like the absolute perfect turtleneck! Cute coat!! Sounds like a lovely Saturday! 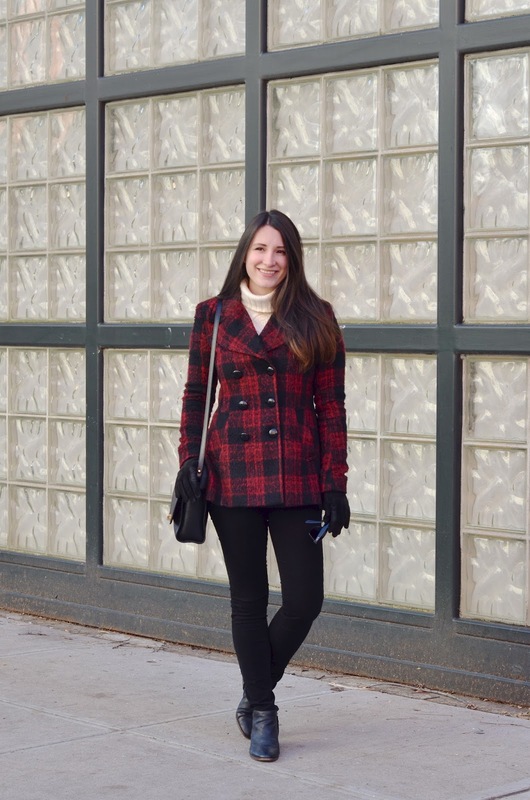 Gorgeous plaid coat a look for the working women great post! I love styles that fit day to day life and you nailed it! That jacket is SO good! Love the boots too! I actually just ordered a pair very similar to that style! I love that jacket! 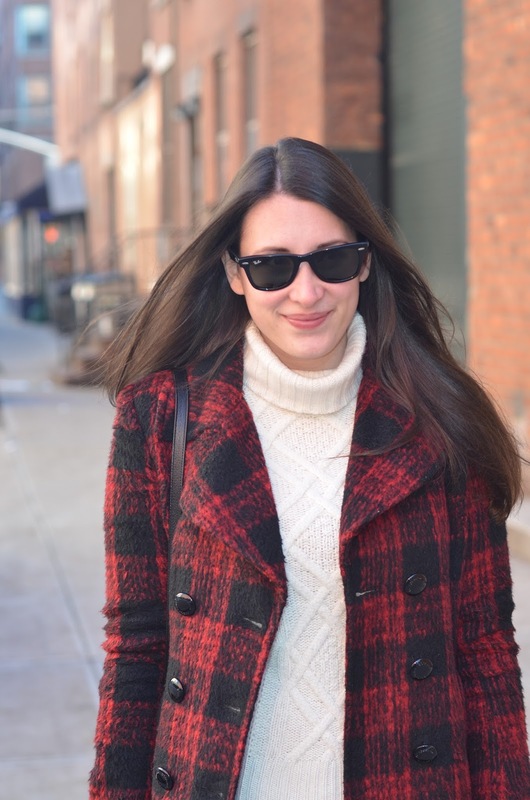 Turtlenecks are a favorite layering piece for me as I hate when my neck is cold. This one looks so cozy!